This is Alexis LaMarsh’s first piece as part of her July Residency at FanGraphs. Alexis is a communications student at Webster University in St. Louis, Missouri. She enjoys breaking down numbers and exploring the cultural side of baseball. She has written for her own site, Pinch Hero, as well as Cardinals blog St. Louis Bullpen. She plans to present research at Saberseminar in August. Alexis can also be found on Twitter @clutchmarp. With action on the field subject to an increasing number of starts and stops and the average time of game climbing in recent seasons, commissioner Rob Manfred has stressed taking active steps to reverse the trend. In 2018, MLB implemented new pace-of-play rules, including mound-visit limits and timers on inning breaks and pitching changes, part of a continuous effort that has been underway since 2015. The effects on game length are still unclear. Per Baseball Reference, the average time of a nine-inning game last season was three hours and five minutes. Thus far in 2018, it’s down to two hours and fifty-nine minutes. 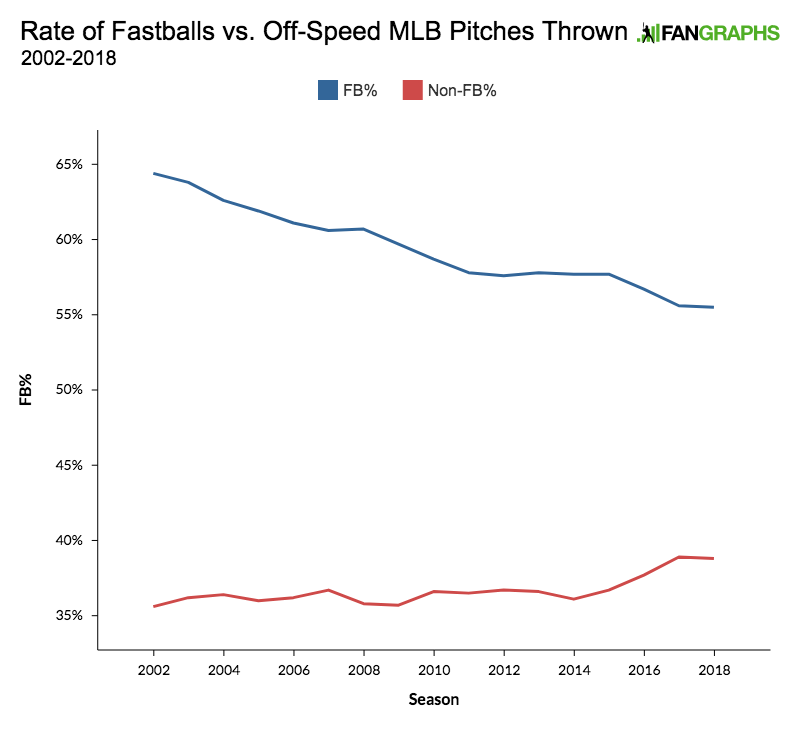 In a recent interview with The Athletic, Manfred credited the league’s recent rule changes for the dip in game time, as well as improvements in the game’s pace, though his comments to that effect were relatively vague. While it’s certainly possible that this year’s initiatives have led to slightly shorter games, Manfred’s claim suggests that he is perhaps missing a larger, more critical point: more than any superficial pace of play component, what happens at the plate appears to ultimately decide the pace and length of games. The current trends on the mound and in the batter’s box suggest that there may be a limit to the efficacy of pace-of-play initiatives. That’s of particular concern in light of the drastic steps the league has discussed to further address the issue. In service to the goal of shortening games and increasing action, MLB may end up adopting a posture that is hostile to innovation. Ben Lindbergh deserves credit for originally pointing out this strike-zone avoidance and its effects back in April. Compounding these effects, longer plate appearances have led to higher pitch count, which has meant starters being pulled earlier. Unsurprisingly, we’re seeing an increasing number of pitchers per game. MLB is currently averaging 4.25 per game, compared to 4.22 last season and 4.15 the year before. More pitchers naturally means more time for pitching changes, even if pace-of-play initiatives have worked to reduce the duration of those breaks in the action. It points to the limits of Manfred’s efforts, however. On a macro level, it doesn’t particularly matter what changes you make to shave off 10 seconds here and 30 seconds there when the game is moving in the opposite direction. For that reason, maybe pace of play as a source of worry should be a thing of the past; perhaps the parallel concern for pace of action should instead be the primary focus. A three-hour game with run scoring and defensive highlights looks radically different than a three-hour game where a strikeout is more likely than a hit. There’s a compelling case to be made that the length of the game isn’t what dissuades people from watching, so much as it’s the lack of action. As Lindbergh illustrated in his aforementioned work, the rate of pitches per ball in play is on the rise — a natural result of the three true outcomes. Baseball reminds us that we can’t have it all. In the name of hitting for more power, for the thrill of home runs and strikeouts, we’ve sacrificed the smaller events that move the game, too. The all-or-nothing approach leaves quite a bit of room for nothing. Manfred recognizes this, as well, but he doesn’t believe it stops there. He’s described this as “ongoing maintenance, making sure it doesn’t go in the wrong direction and trying to move it back in the right direction.” As he alluded to in that same Q&A with Ken Rosenthal, however, the league has been scrutinizing the trends that the use of analytics have produced for the way they’ve stripped the game of action. If changing the pace isn’t enough, the league could take more radical steps to alter the game, whether that means banning shifts or limiting or eliminating mid-inning pitching changes. It’s difficult to imagine the full swath of effects this would have on the game. If pace-of-play initiatives are Band-Aids on bullet holes, these steps might best be characterized as the experiments of a mad scientist. That’s the crux of it, really. We’ve asked the question of how to fix the game and inevitably we’ve stumbled upon the question of how far we should go. But in doing so, we’ve failed to question the underlying assumption that the game needs fixing. Manfred’s focus has been improving pace at the margins but seems to be underestimating the game’s ability to evolve and change on its own. He has, at times, appeared to entertain remedies hostile to the strategies born of advanced analytics. There is precedent for formal change: the mound was lowered from 15 inches to 10 inches in 1969 after pitching had completely stifled offense, and the strike zone has evolved numerous times. Such changes haven’t always been well received, but the game adapted nonetheless. These modern alterations might take hold with only some minor foot-stomping. Maybe, though, this time will be different. Manfred sees the analytics-inspired trends as culprits, while the game sees them as fundamental components. But this isn’t lowering the mound or shifting the zone; it’s tampering with the engine that runs modern baseball. What’s most disturbing is not that the league suggests change but rather that its changes conflict with the way front offices are using the knowledge sabermetrics has offered. It could lead not just to player adjustments but to an entire reshaping of the modern theory of the game. Consider limiting mid-inning pitching changes, as suggested in Rosenthal’s interview with Manfred. Though all we can do is speculate, it’s fair to suggest that it would change bullpen usage entirely. Managers would have to redefine what “getting into trouble” means for a pitcher and prepare for such events accordingly. Buster Olney has suggested putting a four-pitcher cap on nine-inning games, similarly limiting pitching changes. He acknowledged that the statistical advantage of creating more matchups but argued that its negative effect on offense was unpopular among fans. The ripple effect may be enormous: pitchers would be forced to throw more innings against their conditioning, while games may be extended in time due to increased offense. Banning or limiting shifts would make similarly little sense in practice. As Lindsey Adler has pointed out, the rulebook doesn’t have any limitations in place on positioning, nor does anyone have a clear definition of the shift. These strategies, among other modern philosophies, have become a natural part of the game. We can debate their efficacy, but we ought to be open to strategic innovation. Never before has the league taken such an aggressive approach. The game could reach a dire standstill and require league intervention, but one season of waning offense isn’t enough to justify measures like these. 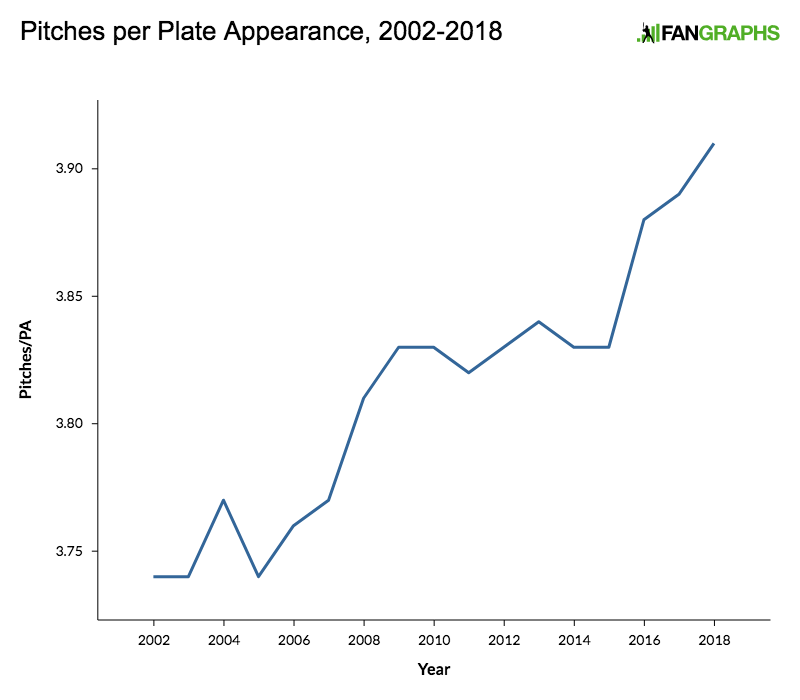 There are unavoidable truths about this trend: pitches per plate appearance and pitchers per game have continually trended upward, albeit with some fluctuation. Strikeouts have also been rising. That seems to indicate that baseball has entered a new condition. But runs per game and walks per game have fluctuated depending on whether hitting dominates or pitching dominates. Baseball is cyclical and self-correcting. Analytics told us hitting the ball in the air was preferable to hitting it on the ground. It’s no coincidence that after offense sputtered in 2014, the home run re-emerged, much to the league’s delight. When it did, pitchers had greater incentive to keep the ball down and out of the zone. Data showed us all of this. There’s no reason to believe that the future will be any different; when the game demands new advantages, it will find them. That has precedent. The beauty of today’s baseball is that it has been gifted with a rapidly growing understanding of itself, advancements in technology, and dedicated, inquisitive minds to put those advancements to use. Manfred is paid to worry, but I might suggest patience over panic — something will budge, and this game will keep moving forward. It almost always does. We hoped you liked reading Pace-of-Play Proposals Could Be Hostile to Innovation by Alexis LaMarsh! Seems to me that many rule changes actually provide for more opportunities to innovate based on new conditions. But since I’m sure others will, I have a less drastic rule change that would cut down on mid-inning breaks. Count mound visits to take pitchers out of the game against the limit, allow teams to change pitchers without a mound visit, and give the incoming pitcher 60 seconds from the time of the change to be ready to pitch to the next hitter, from the time of the change. In inning changes will be less frequent because of the shorter prep time and also when they do occur they will take less time. Coaches can come out to the mound to take the pitcher out, but they don’t have to and if it counts as a visit, they probably won’t. There is no reason the pitcher can’t just walk off the field. But I think the author made a pretty compelling argument that Manfred is thinking about straight-up banning certain strategies, which is definitely hostile to strategies. I also think the author is right that it goes against tradition, and might actually increase game length. So I’m fully with her on this one.